TDI recently won a new contract with BGP Inc. (China National Petroleum Corporation) in the intertidal zone of the Kuwait bay to conduct a geophysical survey and prepare an anomaly avoidance plan in support of their seismic operations. Geophysical surveying entails the preparation of a detailed geophysical map highlighting and accurately marking the position of any metal anomalies contained beneath the surface. The Geophysical team will complete 1900 kilometres of Geophysical survey in the intertidal zone. 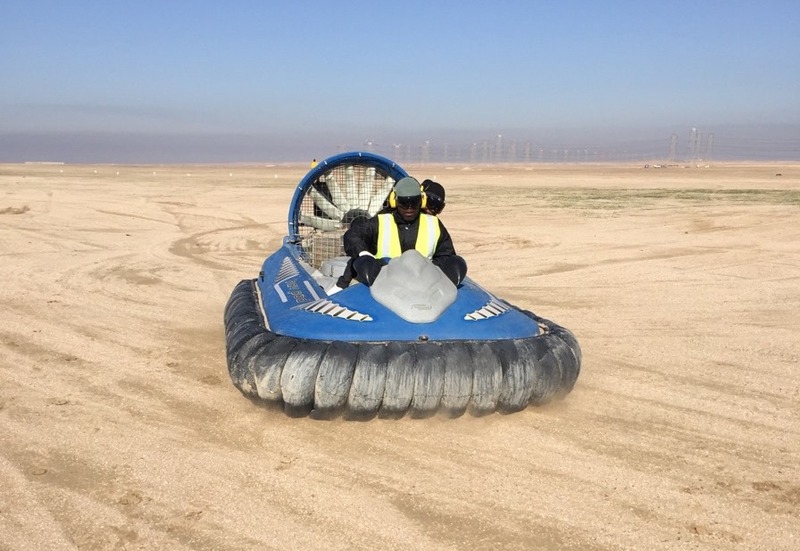 TDI will deploy two bespoke hovercraft capable of carrying the detection system over the intertidal zone which will detect, and record the presence and position of any metal pieces that are present – subject to the size of the metal anomaly. This data is then translated into a map form marking the exact location of the anomaly, allowing the client to plan and prepare appropriate off sets as they carry out their seismic survey. This contract is in addition to ongoing Battle Area Clearance already being conducted in Kuwait for BGP by TDI. The Geophysical survey doesn’t require TDI to identify and/or deal with ordnance or anomalies and there will be no intrusive works within these services. This contract requires anomaly verification only to ensure personnel, drilling rigs and equipment are not at risk due to residual post conflict UXO that may be present in the area. This effectively encompasses the entire coastal area where BGP will carry out their operations, including island areas. TDI will also carry out Risk Education sessions to ensure the drilling teams and BGP staff are aware of the dangers of potential UXO contamination and to report anything that is found.